As I have remarked in several conferences during the past two to three years, the data suggests that if patents are a surrogate for innovation activity, one of the most significant factors in China’s innovation efforts are the time of the year: China innovates in the fall. February, however, appears to be a slow month for creativity, perhaps due to lack of external pressure (government subsidies, quotas), but also due to the hiatus caused by the lunar new year and the 28 day month. 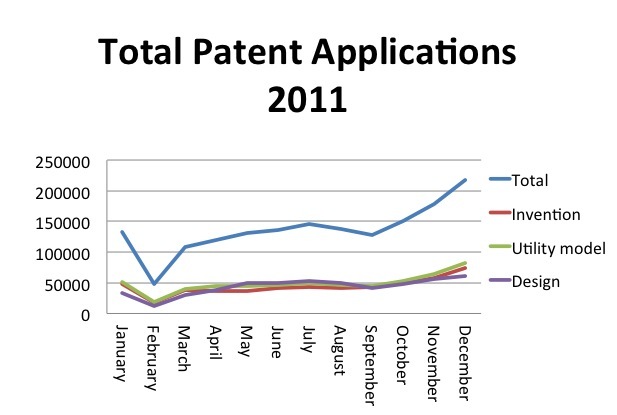 This past year once again reveals a notable spike for total patent filings at year end. The WIPO data suggests that that the magnitude of this “hook” is largely a Chinese characteristic. 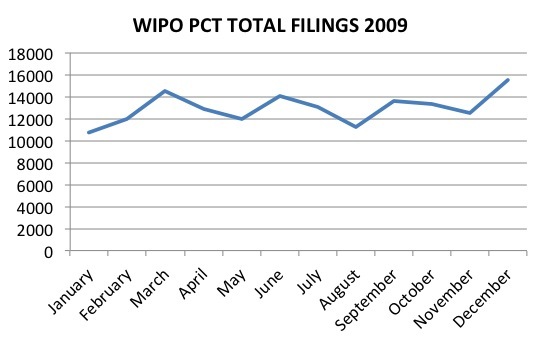 It begins around October and climbs to year end, with a sharper rise than overall PCT filings. There are other trends suggested by these charts. In addition to the upward hook, there is also the February downward “spike,” and a mid-year (June/July) “bump”. The June jump is mild, and looks more like a speed bump than anything else, but its persistence is notable. 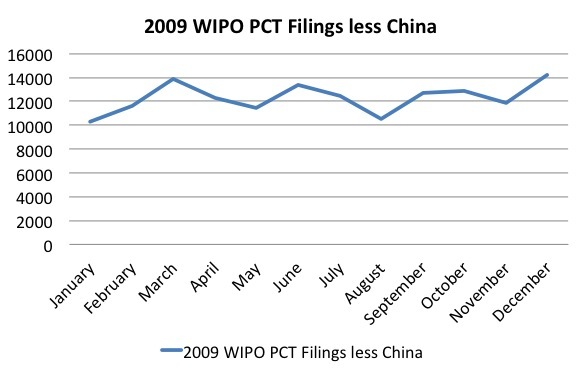 Although the new year downward spike is noticeable, patent filings soon resume the year-on-year upward trend shortly thereafter as China continues its efforts to innovate and file more patents. There are probably externalities that cause these changes. 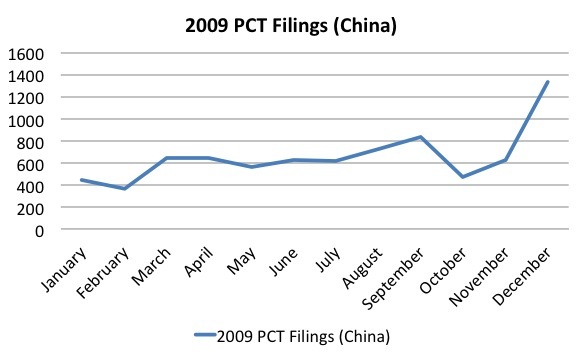 Patent filings most likely drop significantly when the new calendar year has begun, with new budgets in place and the slowdown in activity with the lunar new year. Companies that have mid-year fiscal cycles may be inclined to file patents in mid-year, however this mid-year “speed bump” is comparatively small. 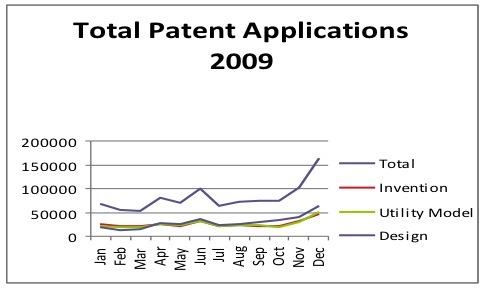 The larger autumnal patent hook is probably due to a number of externalities: end of year government subsidies, corporate budgets, quotas for corporate patent filings, and other forms of government and corporate encouragement for enterprises and research institutions to file more patents by the end of the calendar year. Your thoughts on the causes of this “hook”? How might it compare to Western companies that are under pressure by their management to file more patents? Do you think it has any correlation with patent quality? Are there comparisons to be made with other countries? Written by Mark Cohen with the assistance of Jae Zhou, 2L at Fordham Law. This entry was posted in China IPR, Chinese Intellectual Property practice, Innovation Policy, patent subsidy, Patents, Statistics and tagged China patents, design patents, indigenous innovation, Innovation, patent quality, utility model. 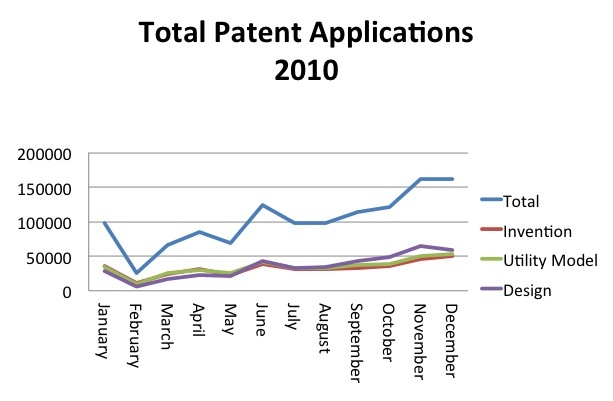 Today in the Huffington Post, James Love wrote about a patent application by numbers, he has done so based on data derived from WIPO as we had done previously. He addresses the increasing number of applications by domestic residents, as well as other issues which Professor Cohen has previously discussed on the blog.